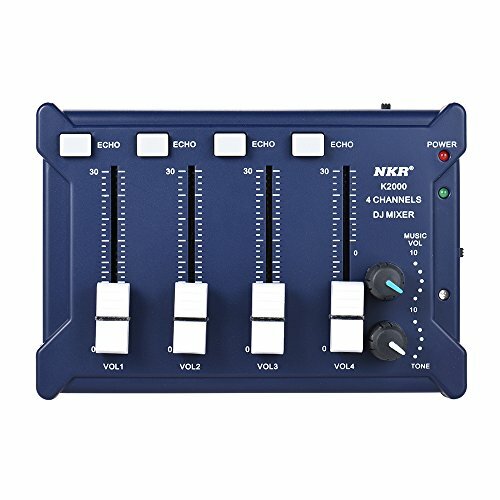 Professional mini 4-channel line audio mixer, can be an external amplifier, passive and active speaker. Adopts high-end IC module, multiple protection offers ultimate security and stability. Excellent circuit design provides great clear sound quality and stable performance. With stereo 4 input / 2 output interface support the connection with microphone, loudspeaker, earphone and smartphone. BT function for connecting the mixer with your mobile phone conveniently. With intelligent Power Failure Recovery function. Built-in 1080mAh Lithium battery, charged via USB port. Comes with a USB cable, power adapter, 3.5mm audio cable, 3.5mm plug to 6.5mm female audio cable, 3.5mm plug to mini USB male plug cable. Stereo 4 input / 2 output interface. Adopts high-end IC module, excellent circuit design.